Courses for certification are open only to physical therapists. Practical training for treating patients with scoliosis. Understand background of SEAS (Scientific Exercise Approach to Scoliosis) approach and the underlying scientific principles. How to perform the clinical and postural evaluation of the scoliosis patient. Understand what is three-dimensional self-correction, and the step-by-step approach to teach individualized self-correction to the patient. Learn how self-correction is performed for different types of deformities: thoracic, thoracolumbar, lumbar, double curve, hyperkyphosis; correlation with the radiographic and postural evaluation, as well as on observed asymmetries. Understand the role of exercises within the SEAS approach, and the criteria used to choose them for an individualized treatment plan. Yoga Therapy for People with Scoliosis Supporting the Teaching of the Schroth Method. This a 3 day workshop that bridges the wisdom of the Schroth Method for scoliosis with Hatha Yoga for a truly inspired, safe, and smart yoga practice. Yoga Teachers: This course is approved for 24 CEUs through Yoga Alliance. "I was so grateful for this workshop. It was comprehensive, extremely informative and delivered with such passion, deep knowledge and clear guidelines." "Hagit and Meredith hit a home run with this presentation! Thank You!" "The teachers were really expert - warm and passionate about the material. I loved the content. It was very useful for me as a teacher of yoga to see what a Schroth student would come to me knowing." "Meredith and Hagit are knowledgeable, clear, energetic and detailed - great listeners - fabulous and exciting to learn from." "An eye opener in terms of treatment for scoliosis - very logical approach!" The Scoliosis Research Society recognizes Physiotherapy Scoliosis Specific Exercise (PSSE) including the Schroth Method as a viable conservative approach to treating Idiopathic Scoliosis, adult degenerative scoliosis and hyper-kyphosis. The International Society on Scoliosis Orthopaedic and Rehabilitation Treatment (SOSORT) recommends that people with scoliosis remain active in the sport of their choice due to the psychological and neuromotor benefits of exercise and improvement in general organic well-being. 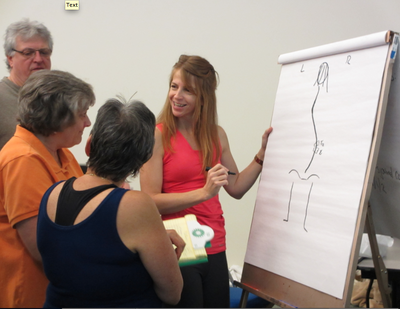 Since there are no specific guidelines to help adults with scoliosis and hyperkyphosis choose safe fitness exercises, this 3-day course presents the theory and evidence supporting PSSE to help inform exercise recommendations for these adult populations. Dynamic skills labs will focus on assessing the Pilates client with scoliosis and hyperkyphosis and on modifying Mat Pilates exercises. The Pilates teacher will understand how to collaborate with other health care professionals in order to develop a team approach for their client with scoliosis and hyperkyphosis. Scoliosis 101 - Fundamentals for Understanding Scoliosis : for all health care professional as well as pilates, yoga and fitness instructors. This two-day course offers an introduction into the non-operative management of spinal deformity (i.e. scoliosis and kyphosis). The experience is open to any health care professional who treats this population, including MDs, PTs, RNs, orthotist, yoga, and Pilates instructors. Participants will leave this course with a better understanding of spine deformity assessment, safe management strategies, and when to utilize scoliosis-specfic healthcare providers. References provided related to recent research on conservative management of scoliosis. research demonstrating the role of vocal folds as postural stabilizers, extending the concept of “core stability” from the vocal folds on the top of the trunk to the pelvic floor on the bottom. Numerous interventions will be presented that use positioning and ventilatory strategies to optimize motor performance. Neuromotor breathing retraining techniques and manual assistive cough techniques will be the focus of treatment labs. Multiple patient cases will be presented throughout the course. The emphasis of the course will be on developing practical, quick clinical solutions for pediatric and adult patients in all practice settings.